Aquafaba is a pretty magical ingredient in the vegan world. It can be used as a substitute for egg whites because it can be whisked into stiff peaks, similar to meringue. What is it you ask? Aquafaba is the liquid from cooked chickpeas and is readily available in a can. I know, it sounds anything but delicious, but with the right amount of sweetener, it tastes great! I first experienced aquafaba pavlova at abcV. I was super impressed and curious about this mysterious ingredient but didn’t start to investigate it until I bought my Instapot. When making Instapot hummus I had so much excess liquid from cooking the chickpeas that I wanted to make use of it. I later learned (after 40 minutes of electric whisking) that the liquid from the cans are more efficient, probably because they’re less watered down. Fixated on mastering the ingredient, I started experimenting with the canned stuff. I learned that some brands take longer to whisk than others. I highly recommend Brad’s Organic Garbanzo Beans, as they whip up into stiff peaks in 5 minutes. With that said, buy whatever brand that is convenient, but stick to those that that only contain the following ingredients: water, garbanzo beans, and salt. Chocolate Mousse is one of my favourite desserts. I love its airy texture and its chocolaty richness. 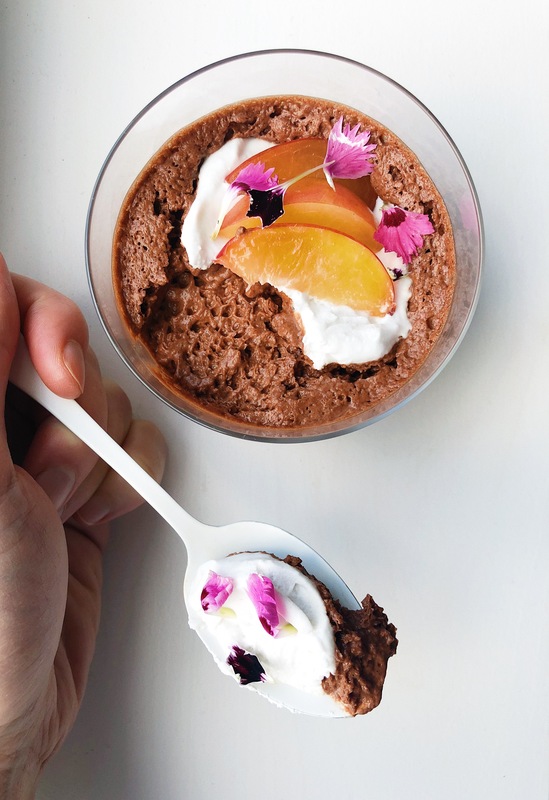 Because my blog is basically a compilation of things I love, I used aquafaba to make a decadent yet healthier plant-based mousse. What’s great is it only requires 4 ingredients and minus the time it takes to set, it can be whipped up (literally) in no time. I took advantage of the summer produce at the farmers market and topped off the mousses with little sugar plums, apricots, and peaches. Feel free to garnish anyway you seem fit, but I wouldn’t skip out on the coconut cream. It’s naturally sweet and compliments the chocolate perfectly. Check out my Instagram highlights where I show you how to make this recipe! Strain the liquid from the can of chickpeas and place the liquid in a large bowl. Chill until cold, at least 30 minutes. Set aside chickpeas for another use. Add the cream of tartar to the chilled chickpea liquid. Using an electric mixer whisk into stiff peaks. This will take about 5-20 minutes (depending on the product). Double boiler method: Heat a small pot with an inch of water and bring to a simmer. Place a medium bowl with chocolate on top. Stir chocolate until melted and smooth. Microwave: Place chocolate in a microwave safe bowl and microwave for 1 min. Stir until smooth. Heat for an additional 10 seconds if need be. Whisk together 1/4 cup of coconut cream with the melted chocolate until very smooth. Gently fold in the chocolate coconut cream mixture into the aquafaba, a third at a time. The mixture will fall considerably, but don't worry, it will set in the fridge. Divide mixture into 4 glasses and place in fridge to set for at least 3 hours. Whisk the remaining 1/4 cup of coconut cream with an electric mixer. Before serving top mousses with a dollop of coconut cream and fruit and flowers if using. Enjoy! 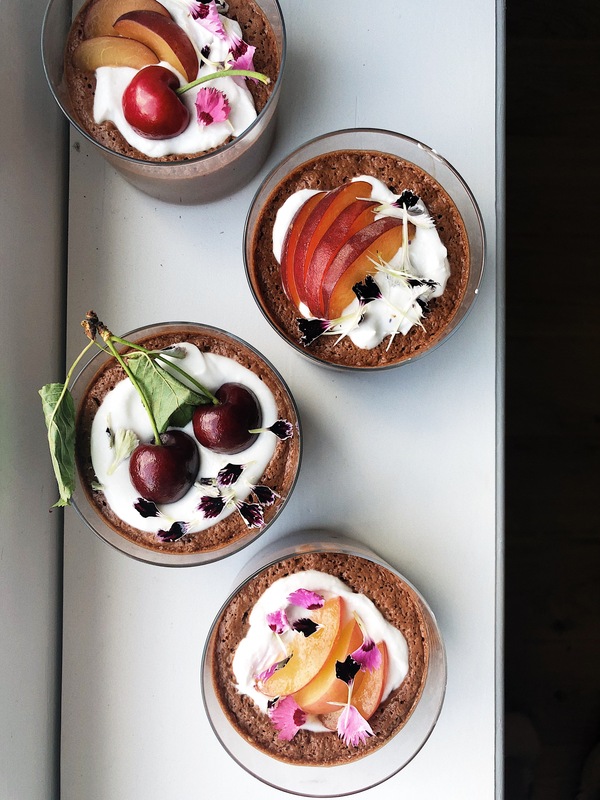 This entry was posted in Dessert and tagged anti-oxidants, aquafaba, chocolate mousse, coconut whip, dark chocolate, dessert, easy recipe, healthyish, mousse, plant-based, raw desserts, simple, Vegan, vegan mousse. Bookmark the permalink.